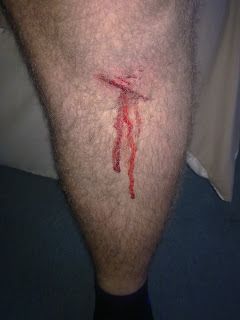 On my ride home on Friday I fell off my bike whist clipped in. I got my right foot out of the pedal and the bike decided to fall the opposite way and I hit the ground. My knee hit the tarmac quite hard and for good measure, the big ring on my bike decided to attack me. It didn't want to stop bleeding so I had to put a dressing on it. All is OK now. What a cracking idea. I have a big ring scar photo like that too. That sounds like a bulletin board to me, don't you think? Lend us one of your pink bandages then Les! Now I know why I unclip the right leg! I find it terminally embarrassing when you fall off while stationery!!!!! Good chain ring scar! Oh cool. I always unclip with my right leg. I notice that most people do left which means that they can lean on the pavement. I thought I was wron and would have to retrain myself. 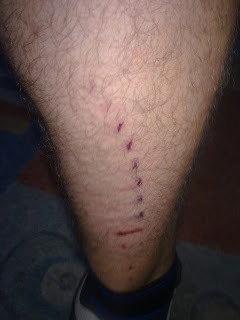 The reason I un-clip with my right foot first is to protect the dérailleur. I thought the derailleur was on the rhs... How useless am I? I'm a lefty. I think it's a subconscious decision but dictated by using my right foot when starting off. I have no pink bandages, but I do have a Mr Bump plaster if it helps. I unclip my left foot, simple reason being I can pedal off easier with my right rather than my left.